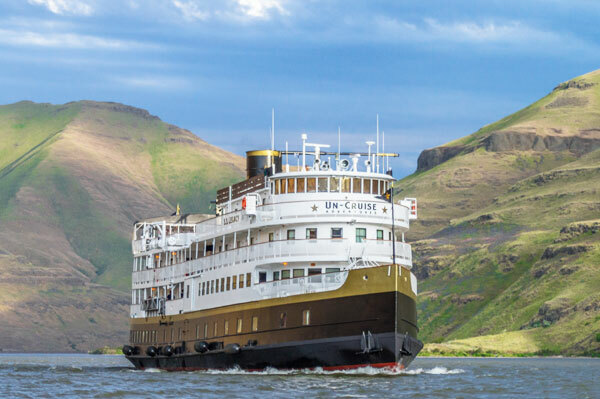 With 15 years’ experience operating river cruises on the Columbia and Snake Rivers in the Pacific Northwest, UnCruise Adventures is changing course to inject more outdoor adventures into the trip with a new Rivers of Adventure itinerary. The 86-guest S.S. Legacy is newly outfitted with adventure gear — kayaks, skiffs, paddle boards, custom boat launch – and an expedition team for eight departures beginning Aug. 24. Eight-night adventure cruises sail one way between Portland, Oregon and Clarkston, Washington (and reverse) with one night hotel included in Portland. The ship passes through eight sets of locks and dams and diverse scenery from temperate rainforests to the rolling hills of the Palouse and high desert. The small ship adventure cruise line is offering a US$250 per couple savings for guests booking their trip by May 31 for travel August through October. Agents are advised to mention promo code RASPRING18 to receive the savings. Highlights of the itinerary include whitewater rafting on the Deschutes River, biking in the Columbia Gorge, hiking the Rowena Plateau, kayaking, swimming and a jet boat ride into Hells Canyon. Guests also tour the Bonneville Dam, Palouse Falls State Park and Terra Blanca Winery & Estate Vineyard. Expert guides share history of the Lewis and Clark journey, Nez Perce and the Oregon Trail. Cruises start at US$4,995 (before savings) and are inclusive featuring freshly made, innovative meals; all beverages, including alcohol; adventure activities; transfers day of cruise and wellness amenities such as complimentary massage. Port taxes and fees are additional. To book or to request additional information, contact your travel professional or UnCruise Adventures at 1-888-862-8881 or sales@uncruise.com.